1R. Borkowski (e-mail: rbor@fotonik.dtu.dk), A. Caballero, and I. Tafur Monroy are with DTU Fotonik–Department of Photonics Engineering, Technical University of Denmark, 2800 Kgs. Lyngby, Denmark. 2R. J. Durán, N. Fernández, T. Jiménez, J. C. Aguado, I. de Miguel, and R. M. Lorenzo are with the University of Valladolid, 47002 Valladolid, Spain. 3C. Kachris, D. Klonidis, and I. Tomkos are with Athens Information Technology, 19002 Peania, Greece. 4D. Siracusa, A. Francescon, and E. Salvadori are with CREATE-NET, 38123 Trento, Italy. 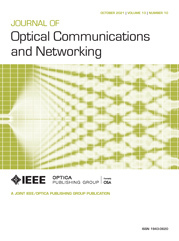 The aim of cognition in optical networks is to introduce intelligence into the control plane that allows for autonomous end-to-end performance optimization and minimization of required human intervention, particularly targeted at heterogeneous network scenarios. A cognitive network observes, learns, and makes informed decisions based on its current status and knowledge about past decisions and their results. To test the operation of cognitive algorithms in real time, we created the first operational testbed of a cognitive optical network based on the Cognitive Heterogeneous Reconfigurable Optical Network (CHRON) architecture. In this experiment, an intelligent control plane, enabled by a cognitive decision system (CDS), was successfully combined with a flexible data plane. The testbed was used to test and validate different scenarios, demonstrating benefits obtained by network cognition, particularly lightpath establishment and a teardown scenario, improved failure restoration time, cognitive virtual topology reconfiguration, and a modulation format change. a Channel under test underlined. ITU channels’ frequencies: C 31 = 193.1 THz , C 30 = 193 THz , C 29 = 192.9 THz , C 28 = 192.8 THz .